Looking for business invoice templates? We've got you covered! Do you need more than just a web design invoice template? If you want an invoice that looks as professional as your business is, you're in the right place. 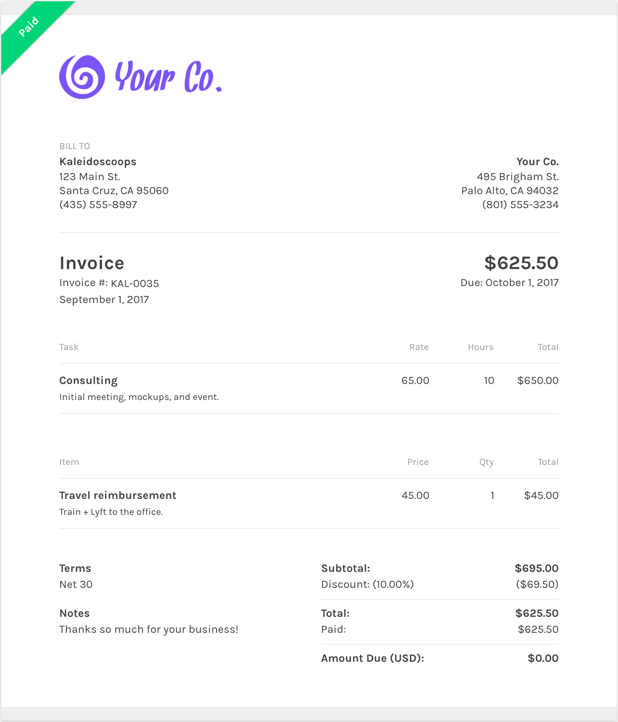 ZipBooks has created a business invoice template just for you. The design is clean and fresh, and we help you to create the most professional invoice you can—which will also get you paid faster. What should I include on my business invoice template? Using ZipBooks for your business invoice means never sending off an invoice without your own company’s information on it (oops!). We’ve collected data from tens of thousands of invoices and use it to score your invoice based on what information you include so you’ll get you paid faster. This is part of the invoice template that you can add yourself. Save your company logo under company settings and your invoice template header will always match your other invoices. Thanking a customer for their business will always make you stand out in a crowd and helps you get paid faster. Another great free feature of ZipBooks invoice templates is that when you put terms into an invoice, we automatically detect it and set the due date you chose. If you don’t set terms, we assume that the invoice will be due in 14 days. This one might seem pretty straightforward, but it should always be on the list. By manually entering in invoice details or using the time tracker, ZipBooks’ invoice template can show you a detailed account of everything that you have charged since you last sent an invoice. Why should I use ZipBooks’ business invoice template to create and send my business invoice? You can track multiple clients, projects, and team members on different hourly rates based on the skill level of the person of the client, what project you are on or even based on the client. Reminding clients to pay isn’t that fun but when the retainer is running low it’s nice to know that you can setup logic based on when you sent out the payment and how long the client has gone without paying. You can setup an unlimited number of reminders that communicate an escalating sense of urgency about non-payment. No one wants to stiff their lawyer, but if they are slow to pay you can outsource the tedious followup task to ZipBooks. Everyone knows that you get paid faster when you let your client pay by credit card. ZipBooks has the slickest invoice payment method of any invoice template that you’ll find. All you have to do is connect to ZipBooks payments and turn on the accept credit card payment option and the credit card payment form will show up right next to the online invoice. There are zero auto-billing options that are free besides ZipBooks. It is especially useful for developers and designers looking for a web design invoice template because many clients get billed a monthly retainer. If you use ZipBooks, you are going to be able to setup a recurring profile that sends an invoice to your client on a recurring basis that you set and if you enable autobilling, your client will automatically be billed after they submit payment for the first invoice.